Is the delay in your daughter's marriage giving you sleepless nights? In today's era, one of the major issues parents are facing is delay in marriage of their daughters. According to a belief in the Indian society, if you get your daughter married, you pay all your debts. There was a time when elders in a family got their daughters married at a tender age of 12 and 15. But times have changed. The age of 25 is considered appropriate for girls to get married. The prime reasons for the delay are education, career etc. 21st century girls are more ambitious. Today, girls and boys have an equal right to education. Girls now explore all the careers that only boys used to explore. Even parents have become broad minded. They now allow and encourage their daughters to complete their choice of education. This may be considered as one of the reasons for delay in a girl's marriage. Here, I will discuss the Yogas, which result in delay of a woman's marriage. 7th House is considered as the House of marriage according to Parashar. If the 7th House or the Lord of the 7th House is afflicted, combust, retrograde or in Rahu Ketu axis, there is likely to be a delay in marriage. (1) Retrograde Planet: If the 7th House, Lord of the 7th House, 2nd House or Lord of the 2nd House is retrograde or placed with a retrograde planet, there may be delay in marriage. (2) 7th House or Lord of the 7th House connected with 6th, 8th or 12th House or Lord of the 12th House or placed in their Nakshatra. (3) Afflicted 4th, 8th and 12th House from Moon. 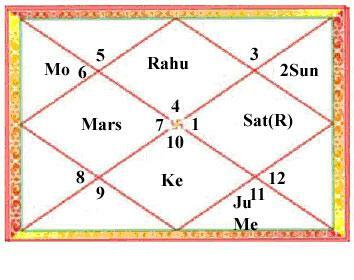 (1) Lagna and 7th House are in Rahu Ketu axis. (2) Lord of the 7th House, Saturn is retrograde and in its debilitated sign. (3) From Moon, Jupiter, the Lord of the 7th House is placed with Mercury, the Lord of the 12th House. This also results in a delayed marriage.